The CWT-107™ is a research quality, open loop wind tunnel for thermal characterization of components, boards and heat sinks. It can produce uniform and homogeneous flow, up to 5.5 m/s (1100 ft/min) within the wind tunnel’s test section due to its polynomial shape and internal flow management system, which features honeycombs and screens to break up turbulence. The CWT-107™ can be operated vertically or horizontally and is made of aluminum and stainless steel with a see-through test section for ease of flow visualization. 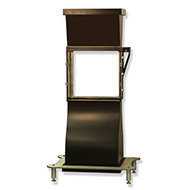 The wind tunnel has an access door, conveniently located in the front of the test section for the mounting of boards and, optional internal rail guides that allow for the simple installation of different test specimens such as PCBs and heat sinks. In addition, there are 18 sensor ports in the front and on the sides of the test section for inserting a variety of probes, such as thermocouples, Pitot tubes, velocity measuring sensors, etc. Each CWT-107™ fan tray is equipped with 24 volt-DC fans, which are individually controlled to generate airflow, and is fully compatible with ATS’ WTC-100™ Wind Tunnel Controller that helps automate thermal characterization. ATS also carries a full line of temperature, flow and pressure sensors and scanners that are designed for use with the CWT-107™.